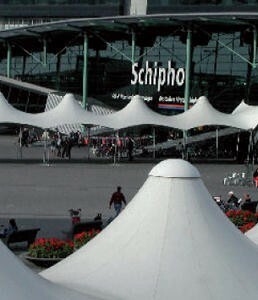 Instead of replacing the old mainline station with a whole new building on the Amsterdam Schipol Airport forecourt, the latter was partly roofed over with a new design developed by Benthem Crouwel Architects. These corridors ensure departing passengers to arrive dry in the arrivals hall. The whole structure including the foundations has been installed at a depth of no more than 50 cm, full of pipework. A greater depth was not available because of the train tunnel below. Horizontally adjustable foundation beams can be found crosswise between each tensioning point.